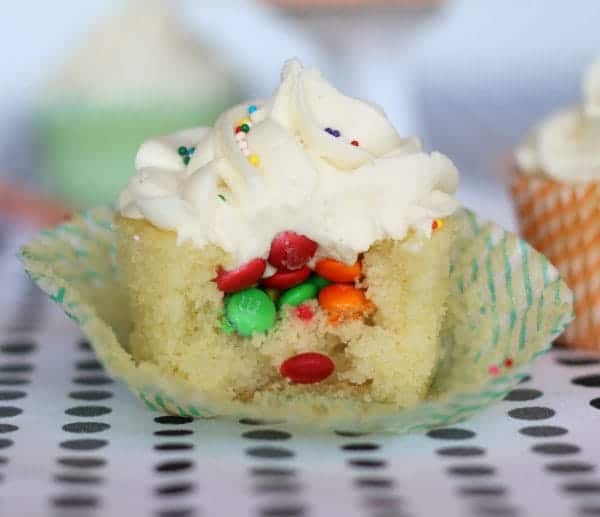 These cupcakes aren't actually named "Pinata Cupcakes," but they're basically the same as the "Pinata Cakes" and "Pinata Cookies" that have been making their way through food-blogisphere recently. These Vanilla Surprise Inside Cupcakes were made by Rachel Cooks and were featured in a guest post on I Am Baker. I absolutely love putting surprises inside cupcakes. It's gotten to where I don't even like to make cupcakes if there isn't something magical on the inside. That's why I love these cupcakes. There isn't just one surprise inside, it's a whole bunch of surprises! As in M&Ms! For the recipes and tutorial, check out the whole post here!